I had never gotten to making pasta before as it seemed like I’d need “a lot of new Italian cuisine stuff” and D wasn’t going to let me stock up on a dozen herbs and spices and cheeses and whatever else it was that every good-looking pasta recipe called for. Then one day, I came across a spice mix – just a random pick while browsing through the grocery aisles (well, that’s why D prefers to go get groceries by himself). The ingredients were all familiar from the popular Italian dishes and I though it was good enough a substitute for me to get started with some Italian recipes. This turned out to be an awesome find and it helps me whip up some really tasty, flavorful Italian-ish dishes from time to time. Every time a recipe calls for basil or oregano and garlic power or chili flakes, I just throw in some of this seasoning. Yeah, that will do for now and authentic Italian cooking can wait! Heat water in a cooking pot and bring to a boil (enough to submerge all the pasta and make up for evaporation during the cooking process). Add salt to season the pasta (the water should taste ‘salty’ but not very salty). Add the pasta and let it cook on high heat for about 8-10 minutes (you can check it if you suspect it is done by taking one out with a fork – the pasta shells should be soft enough to pinch and cut open but not mushy or mash-able). Turn off the heat and dump the pasta and water into a colander to drain out all the water. Treat the pasta to some “cold shock” – place the drained pasta in the colander under some running cold water to stop the cooking process. You could add a few drops of oil and toss-up the pasta if you feel it might stick together. While the pasta is cooking you can start working on the sauce. Heat some oil in a heavy bottomed pan. On med heat, add the garlic and saute for 30 seconds until cooked. Add the vegetables, salt and pepper and cook for 4-5 minutes on Med-High heat. I used mushroom stems leftover from the stuffed mushrooms, zucchini & beans. Add the tomatoes and 1 cup water and cook with lid on for another 10-15 minutes, stirring occasionally. The liquid in the sauce would reduce down over time. Add the Italian seasoning, check and add more salt if needed. Cook for another 3-5 minutes or until the vegetables are done but have a little bit crunch left in them and the liquid in the sauce has reduced to desired consistency. 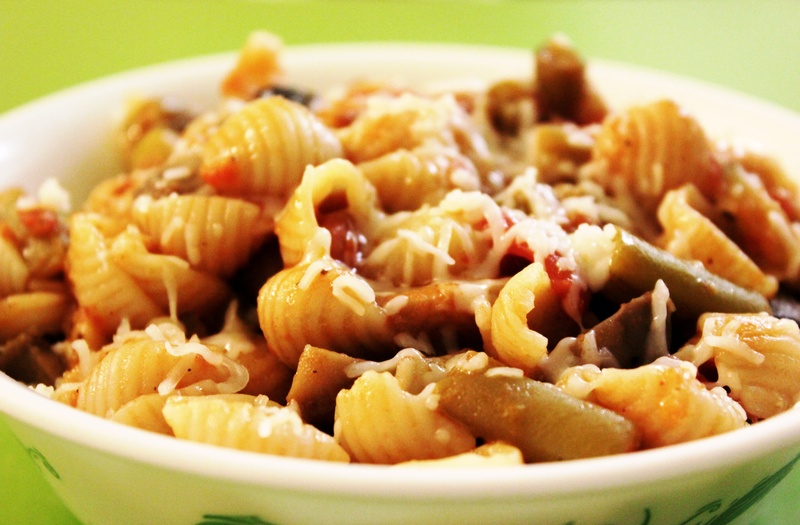 Add the cooked pasta shells, and mix it into the sauce, cooking for a couple of minutes and then turn off the heat. Add the butter and lemon juice and mix well. Ladle the saucy pasta into serving dishes or bowls and add the shredded cheese on top (about 1/2 tbsp per serving or to taste) for garnishing. I used Sylvia’s Sizzlin’ Hot Spice for the Italian seasoning, but this can be substituted with any other similar seasoning mix from the store or your own combination of spices and herbs like oregano, basil, red pepper, parsley, salt, garlic, etc. 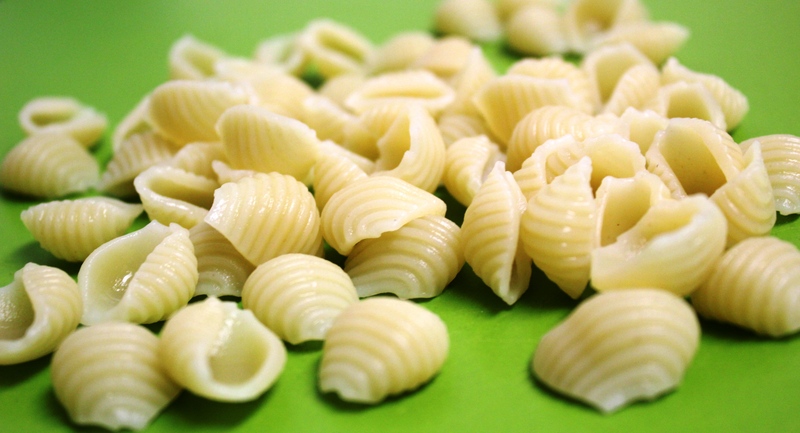 You can use any variety of pasta for the dish – I like shell pasta as it seems to have a very nice crunchy texture and also has more surface area to absorb the flavors of the sauce.